Lumineers by Cerinate have become established as pioneers of Low Prep Veneer Dentistry. It is becoming well known that most porcelain veneer products require significant invasive tooth preparation to accommodate the added thickness of the veneer laminate. For some patients, the degree of preparation causes sensitivity problems that are difficult to rememedy. To find out how minimum-prep Lumineers can help you, please call Dr. Sussman and Dr. Pogal today at 585-227-4390 for a free consultation. Our dentists offer porcelain veneers and other services for patients in Greece, Rochester, and other Upstate New York communities. Some veneer dentists have made attempts to modify the degree of tooth preparation (grinding off enamel) by minimizing the amount of tooth structure that is removed.... only to discover that the veneer treatment results in a cosmetic appearance popularly characterized by Chiclet teeth or fat teeth. Understandably a cosmetic result that is not desired by anyone, the fat teeth appearance occurs because insufficient tooth structure has been removed. The added thickness of many veneer products make the patient's teeth bulge out... or appear chunky. Click on Picture to Watch Video Lumineer Veneers are extremely thin products that eliminate the need for the customary degree of tooth preparation. Tooth sensitivity issues typically do not arise with Lumineer Veneers. Dr. Sussman and Dr. Pogal now offer Cerinate Lumineer products as an additional treatment choice for creative veneer makeovers, diastema treatment, instant orthodontics and smile line correction (the arc of the lower edge of upper teeth follows the arc of the lower lip when smiling). Lumineer veneers can be the perfect makeover treatment for patients seeking minimally invasive dentistry that preserves what Mother Nature originally provides. The ulta thin laminate eliminates the concern of exposing dentin or destroying tooth enamel which can lead to sensitivity problems. Lumineers were used in an uncommon veneer makeover treatment for a young teenager. With traditional veneer treatment, dentists typically recommend getting veneer products at age 19 to 21 or so, after the final growth cycle (spurt) has occured. 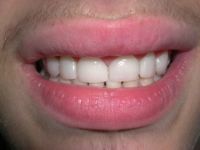 The 15 year old patient however was at the point where he refused to attend school due to the cosmetic appearance of his smile. He could no longer manage or disregard the embarrassment he felt every time he smiled. 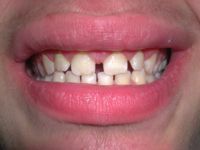 Uneven and undersized teeth, lack of symmetry and multiple diastemas were the most prominent characteristics the patient wanted to change. Consulting with the patient and his parents, Dr. Sussman outlined a treatment that would require no tooth preparation and no anesthetic. The post treatment photo shows off a great looking set of teeth that have achieved the patient's cosmetic goals. Notice how the sizing of the newly treated teeth are age appropriate and fit the patient's new smile.... along with his new smile line. Since no invasive procedures were applied, the tooth structures can be retreated, as needed, after they reach adult size without the usual concerns that accompany traditional veneers. Our young patient and his parents were very pleased with the outcome and the impact it has had on the patient's self esteem and social activities. Lumineer Low Prep Veneers - Who can be a candidate? Contact Dr. Sussman, Dr. Pogal, and our cosmetic dentistry team online or call 585-227-4390 today for a free consultation to determine how custom no prep or low prep dental veneers can help you obtain the cosmetic or functional outcomes you have been seeking, but haven't been able to find. We welcome patients from Greece and the surrounding areas of Upstate New York to our office in Rochester.